At Reality Based Group, we invite you to learn more about our approach and revolutionary customer experience solutions. Whether it’s a news story or our latest ebook, you can find RBG news and publications here. Watch our Executive Vice President, Renee DeSantis, talk about our GameFilm® video mystery shopping and written mystery shopping programs on Good Morning America. 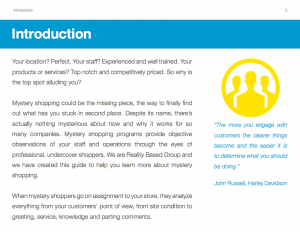 Learn more about mystery shopping with our first ebook “A Quick Start Guide to Mystery Shopping Programs.” Whether you’re new to mystery shopping or want to learn more about how mystery shopping can help your business, our guide covers the basics and lets you explore different types of mystery shopping and their advantages. 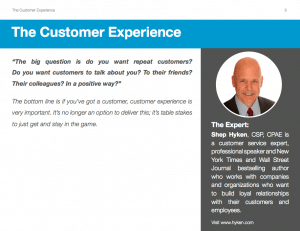 Explore the customer experience and its role in differentiating your business from the competition with our second ebook “Is Customer Experience the Last Differentiator?” With expert interviews and insights from Shep Hyken, Colin Shaw of Beyond Philosophy, Loyalty360’s Mark Johnson and Gini Quiroz of K&N Management, we answer exactly how essential delivering a great customer experience is to your success.